The basic rule of thumb is to do a 5-year growth projection. Your projection should have both a conservative and an optimistic outlook. The conservative outlook is what will definitely be achieved and the optimistic outlook is something which is more of a possibility. The hardware selected should meet the requirements of the 5 year conservative growth projection. The same hardware should be scalable to meet the requirements of the 5 year optimistic growth projection without making another round of investment. The choice of hardware is a major decision you need to take to make an efficient backoffice operation setup. The right setup should be a balance of Server Hardware, SQL Edition, Storage Devices and considering a RAID array for safety. 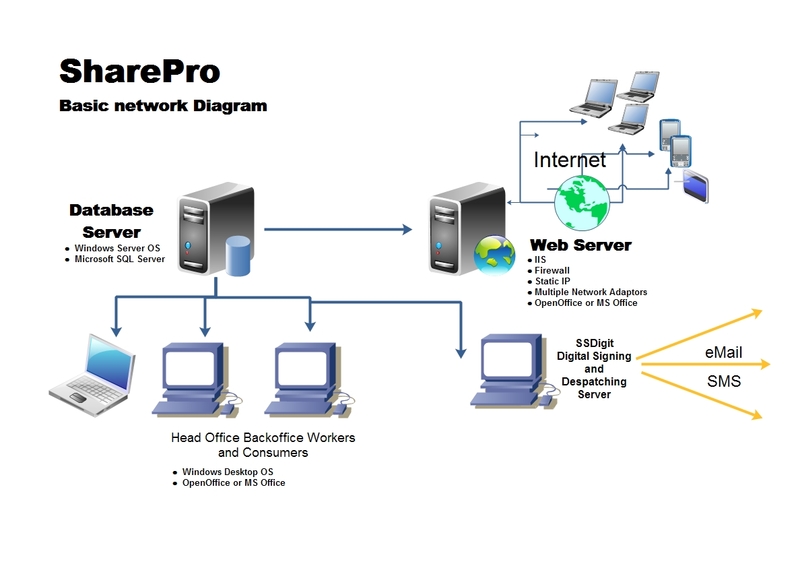 The choice of Web Server is critical aspect of defining the user experience. The right setup should be a balance of CPU, RAM, IIS configuration and safety features. Reverse Caching should be disabled on the Web Server. Web Server and SSDigit Router should be adequately protected with a Firewall. Web Access requirements for your clients and branches. Web Users including clients, branches and CRM users need to have a browser (recommended Google Chrome). Branches also require scanners/camera to upload cheques to RMS Team for increased limits and KYC documents if KYC is entered by branches. These are the PCs that do the heavy duty lifting by your staff inside your premises. Any Intel i3 series or AMD FX4 series system with HDD (Barracuda / Caviar i.e.7200 RPM) with RAM (4GB) and Display (17″ or more). With Windows 8.1 and MS Office/Open Office. Outlook is required only if mails are required to be sent from the local system. Live RMS server needs to be connected with the trading networks of all the exchanges to receive trade data and rate broadcasts. Hence it cannot be hosted at a Datacentre. MS-Outlook (with the Outlook Security Patch for bulk auto-send) OR a Linux/Windows mail server for bulk emailing. Digital Certificate to be setup to send signed emails. API based SMS (URL, Username, Password, Success or Fail flag) for sending bulk SMS. A small broker can begin with an in-house virtualized server hosting 1) a database server, 2) Web server, 3) SSDigit Router, 4) Live RMS Server and 5)Linux/Windows in-house Mail Server. System resources can be shared and optimized for e.g. Live RMS Server can be switched off after trading hours, etc.. Host system should have a CPU that has VT-x with built-in VT-d, Instruction Set Extensions SSE4.1/4.2, AVX and Graphics Base Frequency of 650 MHz. If the hosting is at a data centre, then a minimum 1MB (recommended 2MB) leased line connectivity is required for good Desktop user experience. 132 col printer/line printer for pre-printed contracts. Desktop Scanners for scanning KYC documents and signatures.